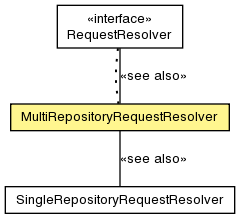 A RequestResolver implementation that expects the first segment of the URI is the repository name, the second is the workspace name, and the remaining form the node path. This resolver does handle the case when only the repository name is specified, or only the repository and workspace names are supplied, or when not even the repository name is given. The regular expression that is used to extract the repository name, workspace name, and node path. The string representation of the Java version of the PATH_PATTERN regular expression. The regular expression that is used to extract the repository name, workspace name, and node path. Group 2 will contain the repository name, group 4 the workspace name, group 5 the node path (with leading slash). Any of these groups may be empty (or null). The regular expression is /?(([^/]*)(/([^/]*)?(/(.*))?)? )?.